LVD Company has expanded its Dyna-Press Series of compact, portable, high-speed electric press brakes with two 24 ton models that offer higher capacity and a longer working length. The Dyna-Press series are ideal for cost efficient bending of small parts. Rapid acceleration and deceleration of the electrical servo-driven ram delivers bending speeds up to 25 mm/s. The new models can handle bend lengths up to 1250 mm and have 24 tons of bending force. The coupling of the ram and servomotors is realized through two heavy duty ball screws to distribute force and tonnage evenly across the working length. Compact and portable with a footprint of just 1140 x 1760 mm, the new Dyna-Press models save on valuable floor space and can still be conveniently relocated using a standard forklift. Dyna-Press 24/12 standard models are equipped with two CNC controlled axes (X, R) and additional Z1 and Z2-axes for the Dyna-Press 24/12 Plus model. 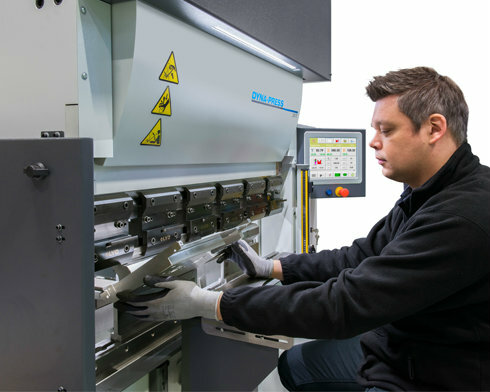 An extensive range of upper and lower tools are available for and can be used on the Dyna-Press. The Dyna-Press 24/12 standard model has a 12” touch screen which allows operators to easily adjust individual parameters. The 24/12 Plus model offers TOUCH-B Lite control which enables the operator to create and simulate 2D-designs on a 15” touch screen. 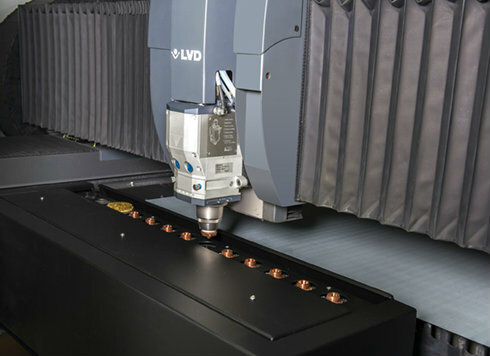 Additionally the TOUCH-B controller is compatible with LVD’s offline bending CAM software CADMAN-B®. Just an enthusiast of sheet metal fabrication.